Have you ever taken Côte de la Montagne down to the Old Port while a cruise ship is docked at Pier 21? The view is breathtaking! You can really see just how big these giants of the sea are and why Québec City is such a highlight for cruise ship passengers, whether they’re starting or ending their trip here or simply stopping over. 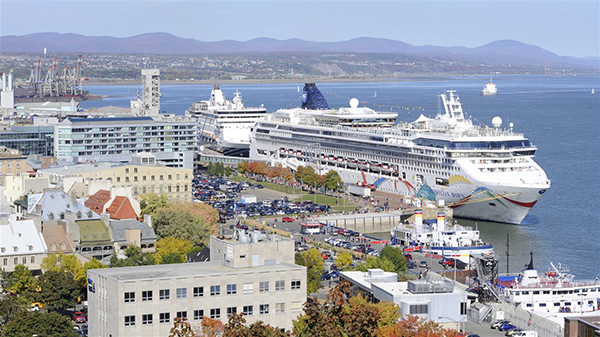 While Québec City has a long tradition of welcoming ships that call at its port, efforts have been made over the past 20 years to make the city a more popular point of embarkation and disembarkation so cruise ship passengers can extend their stay and take full advantage of all Québec City has to offer. Cruise ship passengers are blown away by the beauty and historical charm of the city. 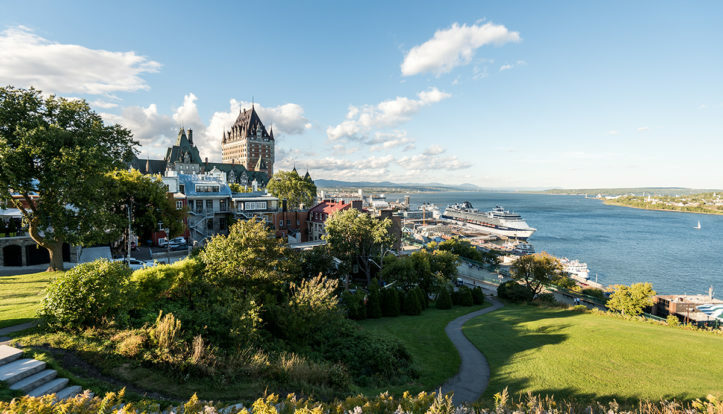 Most of the guests we welcome at Hôtel Château Bellevue are Americans traveling solo who come from as far away as California to see the St. Lawrence River and learn about Québec City’s history. They generally jump at the chance to explore the city at their own pace before their cruise leaves or when they get back. They can use the down time to hang out with friends, meet other travelers, and enjoy every last minute of their getaway, since Hôtel Château Bellevue is less than 2 km from the cruise terminal. Québec City welcomes all kinds of cruises and, while September and October remain the most popular months thanks to the stunning multicolored scenery in the fall, the cruise season is getting longer and longer. The first ships now arrive in Québec City in early May and the last set sail in early November. Over the years, new markets have opened up and we’ve been seeing a lot of new cruise ship passengers. This year, the Disney Magic cruise ship will be calling on September 26 and is sure to make headlines as the Port of Québec rolls out the red carpet for the 2,700 passengers who will be disembarking in Québec City for the first time. Not to mention the Sea Princess, Queen Mary 2, and Adventure of the Seas cruise ships, which are sure to bring admirers and residents from the greater Québec City area into town just to marvel at them. The arrival of these ships is a spectacle in itself, but many companies and businesses in the region also rely on the economic activity it generates. The results of the 2017 Canada-wide study, The Economic Contribution of the International Cruise Industry in Canada showed that the average expenditure for a cruise ship passenger in Québec City was approximately $177, while crew members each spend about $39, for a total of $19 million in spending. The study also found that between 40 and 45% of cruise ship passengers surveyed in Québec had started or ended their cruise at a Québec port, rather than port in the U.S. or the Maritimes. Furthermore, cruise ship passengers were extremely satisfied with the welcome they received from locals, rating it 9.4 out of 10. In 2016 the Québec City region welcomed 151,500 of the 349,900 passengers who visited one of Québec’s ports. Québec City has everything cruise ship passengers are looking for: 51% of passengers come from the U.S. (California and Florida), 24% come from Europe (Germany and England), and the average age is 64. The ships dock in the city center, which makes it easy for passengers to get around. The city is safe, so they can wander around worry-free and return to the ship on foot at any time of the day or night. 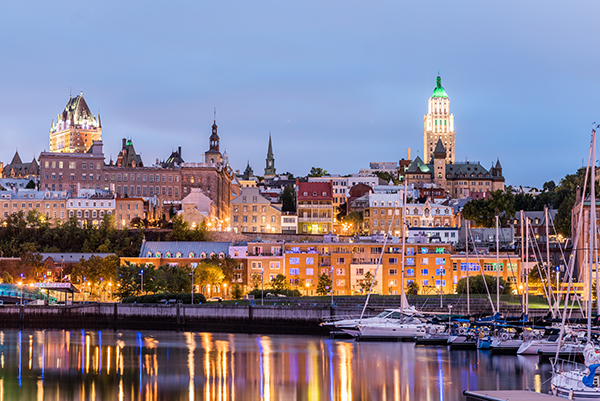 Québec City also has an array of accommodations, restaurants, attractions, shops, and boutiques that are just the ticket for discerning visitors who value beauty and quality. 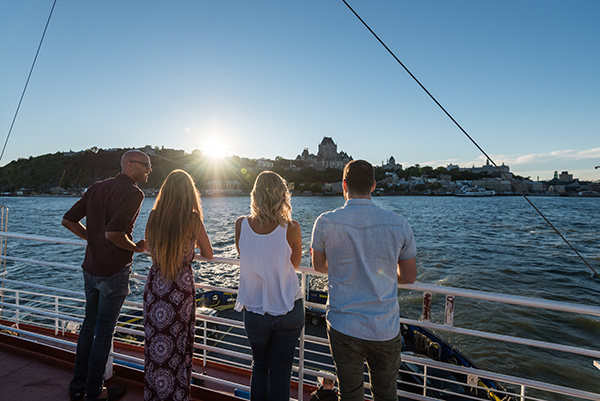 Cruises provide a snapshot of the best that Québec City has to offer, which explains why about one-third of cruise ship passengers say they intend to return to Québec City within three years of their cruise. We’re seeing more and more cruise ship passengers at Hôtel Château Bellevue and we believe this is just the beginning since cruises have been steadily growing in popularity in recent years. In the meantime, head down to the Old Port to watch one of these cruise ships drop anchor or set sail. You can view the schedule here. If you’re anything like me, the enormous white ships will make you feel like you’re on vacation too! I hope you have a great rest of summer and a bright start to fall!